The eNterprise IP Messenger integrates with legacy platforms as well as new methods of communication — like voice over IP, corporate instant messaging and other collaborative technologies to create one all-inclusive and user-friendly communications network. IP Messenger enables you to access, manage and respond to any kind of message (voice, fax or e-mail), using any device (phone, PC, web or PDA), from anywhere (office, road, home or remote), at anytime. 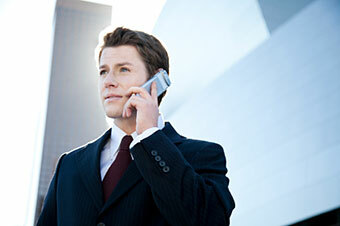 It can even emulate your existing voice mail system interface to eliminate upgrade issues. Enhanced productivity. Greater responsiveness. Increased reliability. Considerable cost savings. Remarkable ROI. Increased responsiveness is most easily outlined in this example: While traveling into the office or out at lunch, an employee can use their cell phone or check their wireless PDA for urgent messages — i.e. voicemails, faxes or e-mail messages. Gone are the days where you would have to power up a PC and find a phone line to connect it to. 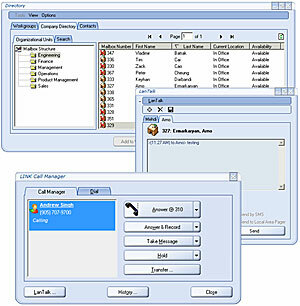 Whether by phone, wireless devices (PDA, Blackberry, iPhone, Cell Phone) or e-mail, and with the ability to manage all of their communications using the rich capabilities of the mail client, all employees can file critical voicemail and fax messages in the same way they file e-mail messages, into a specific folder for future reference or even security compliance. With IP Messenger, respond to messages anytime, anywhere, from any device. IP Messenger is all about security, convenience and choice. Here’s how it works: the sender decides whether to send a fax, e-mail or voicemail message. The recipient then chooses how to access that message, unencumbered in any way by the form of the message. Senders and recipients can choose the device they prefer, dramatically improving users productivity and improving overall corporate responsiveness. Business has become predominately a messaging environment and those companies that figure out how to increase live interactions with customers and reduce messaging with them will deliver the competitive differentiation that will allow them to succeed in today’s global market place! IP Messenger links the mobile workforce to their office infrastructure through speech and presence technology enabling your workforce to answer calls LIVE in real time no matter where they may be. Leveraging Speech recognition technology from Nuance, callers and employees simply say a name or department and depending on the users availability, presence, and location, IP Messenger will connect the caller to the user in real-time, dramatically lowering your daily messaging and vastly improving your customer satisfaction. 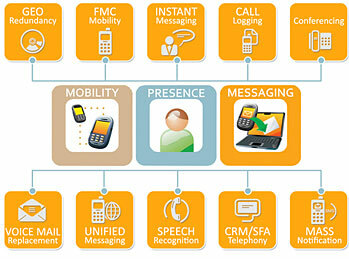 UC Client manager is a real time CTI/Presence application that provides users IP access to the IP Messenger server. It enables users with real-time call control and information from any IP access point! Whether you’re at home, on the road, or in a hotel room, users simply access the internet and log into UC Client Manager. UC Client manager lets the IP Messenger server know where the individual is and provide them instant access to all their office communications! UC Client manager provides remote workers with all the tools they require at a fraction of the costs. It is truly a virtual office application that works with any type of infrastructure! Through UC client Manager users may log in over dial up or high speed access, it doesn’t matter. UC Client manager works with all popular contact manager software packages such Microsoft Outlook™, Act™, Goldmine™ and Multiactive Maximizer. It allows users to work with the applications they are familiar with and add in real-time call control and client information. Agents working from Home can log into the office over the Internet and have client information pop up on their screen prior to the system sending the call to their house! Users can work behind both an IP or a traditional circuit switch environment. UC Client Manager is a Presence management server integrated with Active directory and other LDAP interfaces to deliver LIVE communications between voice and data networks. It enables organizations to know real-time status and availability of their workforce and provide users tools to communicate with one another instantly. Users can identify a caller and consequently prepare for incoming calls—leading to a better customer service in the way they answer and respond to live calls. With Text messaging we have the ability to send a message string out to the lowest common denominator� a cell phone. 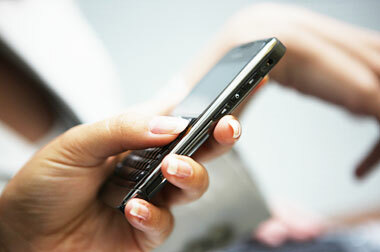 Text messaging provides us a ubiquitous way to blast out a message to a large group of people at once. With intelligent server software we can then look at user profiles and ensure delivery based on their presence. For example, if they're online send the text to their computer, if they are off line sent the alert directly to their phone. Even better, if the phone has no text capability call the phone and play the text back to them leveraging text to speech technology. Adding intelligence to the message alert system can deliver real-time instant notification of any event including natural disasters and emergencies. Text messaging becomes an excellent utility with a feature of "emergency broadcasting" to remote users. With the reality of confused evacuations and natural disasters, a tool such as text messaging provides a means for instant emergency messaging to people in the field or community. Envision hospital attendants sending text messages to ambulance drivers, or campus staff broadcasting a lock-down to its students. They would never get a busy message and the message would instantly end-up on their cell phones and laptops, without having to login to e-mail or check voice mail. Similar to push-to-talk the message can be delivered over any wireless network. The IP Messenger Server enables clients to send urgent messages to multiple devices of subscribers within an entire community or groups of communities to communicate important information. The client software sends the text message and leverages the UC server to look at each user profile, and based on their present status broadcast a text message to a cell phone, PDA, PC, or all the devices at the same time ensuring real-time delivery. Unified Communications is ideal for organizations responsible for the well being of citizens, employees, students, athletes, volunteers, partners, first responders and others. Terrorism. Severe weather. violent crimes. power outage. water main breaks. hazardous material spills. gas leaks. All of these scenarios happen in an instant. The question is, will your organization be prepared to communicate urgent news before it�s too late? Reduce communication costs from TV, radio, paper, mail, posters etc. Traditionally phone dialer systems were created to notify people of important announcements. The main problem with reverse calling systems is that they don�t work well during periods of high phone traffic. For example, wired and wireless phone lines were busy for hours during the terrorist attacks on September 11th. However, SMS text messages went through just fine because they have smaller bandwidth requirements. Following the same example, web sites that posted news of the 9/11 attacks also experienced high traffic loads, thereby making the pages unavailable to many. Website visitors simply saw the message �page operation timed out.� The massive increase in web traffic was similar to a �denial of service� attack, making the website useless for many who needed vital information to determine his/her next step. Wireless networks are virtually in every populated area and reach nearly 200 million cell phones and wireless e-mail devices. Even when the networks become jammed and cannot process voice calls the light traffic of text messaging still gets through! It�s the way to say what you want that doesn't require talking and is always available. The eNterprise IP Messenger offers IT Professionals and knowledge workers advances in system performance and productivity, making the decision to upgrade as easy as counting to five. Anywhere access: Enable your mobile workforce to stay connected: The IP Messenger IMAPTSE gateway provides direct server synchronization between Windows� mobile-based Pocket PC and Smart phones and other mobile devices such as Palm� One, Treo 650 and enabled Motorola� mobile phones. This capability reduces costs by eliminating the need for additional servers and special services.